Carbon and Carbon Hybrid models, which have become the top seller in the US market for various reasons. Musilia has conceived of the Cello case from the ground up, incorporating new concepts along the way. 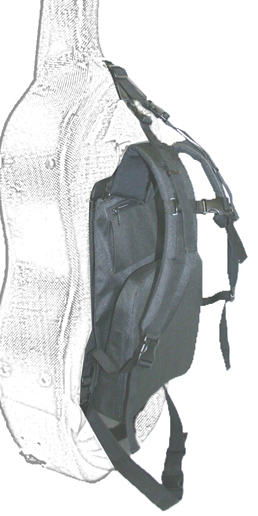 Features such as: easily replaceable hardware, interior adjustment system, and the optional backpack system all set Musilia apart from other cases. Compared to other lightweight Cello cases, each model in the Musilia line competes favorably for weight, protection, and features, but at a competitive price. Musilia cases tend to be more-readily available than their competitors. Instead of waiting months for the model and color you want, you can count on getting your Musilia case much sooner. S series cases are for common, Strad pattern Cellos. M Series are for instruments with larger proportions. We are offering FREE Shipping on Musilia cases. To get this offer, add a case to your shopping cart. Then, return to this page, and click on this Icon. You will see a credit in your shopping cart to offset the cost of standard domestic shipping. This model has a shell consisting of a mix of carbon fiber and fiberglass. These models have the optional shoulder handle pre-installed as a standard feature. S1 weighs 7.8 pounds. M5 weighs 8.6 pounds. All carbon fiber construction, which makes them a little lighter than the S1/M5. These models have the optional shoulder handle pre-installed as a standard feature. S2 weighs 7.0 pounds. M6 weighs 7.7 pounds. All carbon fiber shell model, and is the lightest made by Musilia. The shoulder handle is not available with this model. S3 weights 5.5 pounds.